New MR technologies incorporating contrast and noncontrast methods have resulted in major advances in pulmonary perfusion imaging. Pulmonary perfusion can be imaged by using an inversion recovery turbo FLASH sequence with an ultrashort TE and 1 msec temporal resolution following gadolinium administration . Serial enhancement of the systemic veins, right atrium, right ventricle, and pulmonary arteries to beyond the segmental level can be tracked followed by a gradual diffuse increase in signal intensity of the lung parenchyma over 4-7 sec (Fig. 6). Preliminary reports show the feasibility of this MR perfusion technique in the evaluation of patients with PE. Both 2D and 3D techniques have now been demonstrated. The Beth Israel Deaconess group has performed quantitative analysis on the indicator dilution principle using a pig model of pulmonary embolism . 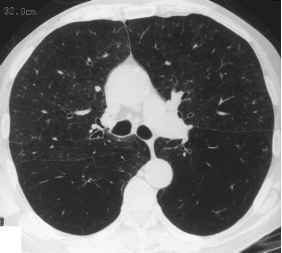 The results were compared with the absolute pulmonary perfusion obtained with colored microspheres. The inverse of apparent mean transit time [1/ tau(app)], distribution volume (V), and V/tau(app) correlated well with the absolute lung perfusion. Dynamic contrast-enhanced MRI also appears capable of demonstrating gravitationally dependent differences in lung perfusion . 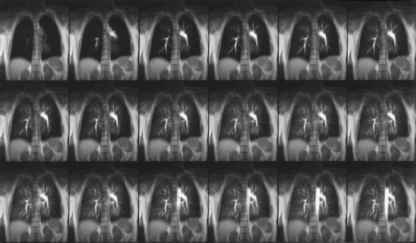 Figure 6 Magnetic resonance perfusion imaging with gadolinium DTPA demonstrating serial enhancement of pulmonary arteries, segmental arteries, lung parenchyma, and aorta. Berthezene and colleagues assessed the accuracy and potential of lung MR perfusion imaging compared with perfusion scintigraphy in the evaluation of patients with suspected lung perfusion defects . Their technique also used an inversion recovery turbo-FLASH sequence with ultrashort TE (1.4 msec). The dynamic study was acquired in the coronal plane and consisted of 10 images of 6 slices (a total of 60 images/series). The average sensitivity and specificity of MR were 69 and 91%, respectively. The overall agreement between MR and scintigraphy was good, with a good correlation between the two modalities (k = 0.63). Their study confirmed the promise of lung MR perfusion techniques in detecting perfusion defects. Figure 7 Pulmonary embolism model: multiple slices from dynamic gadolinium perfusion imaging showing reduced perfusion in several areas bilaterally due to PE. perfusion, has the potential to increase detection of thromboembolic disease by drawing attention to the specific arteries supplying the regions of reduced perfusion. However, this attractive hypothesis remains to be evaluated in clinical studies. Non-contrast-dependent techniques demonstrating parenchymal perfusion have been developed by Edelman and coworkers using modifications of the signal targeting and alternating radiofrequency (STAR) sequence . For each breath hold, two sets of images are acquired. In one set of images, an inversion recovery pulse is applied to the right ventricle and main pulmonary artery to invert the magnetization of blood within these structures. After an inflow period (TI), data are acquired using a HASTE pulse sequence. 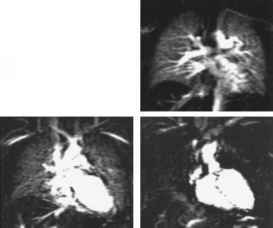 The subtraction of the two images is the perfusion image. A further development based on this principle is the flow-sensitive alternating inversion recovery with an extra radiofrequency pulse (FAIRER) sequence (Fig. 8). Mai et al. have reported on the FAIRER sequence, which also involves acquiring two images: a control and a tagged image [39,40]. A spatially selective inversion pulse, followed by a selective 90° pulse, precedes the control image. A nonselective inversion pulse, followed by a selective 90° pulse prepares the tagged image. Image acquisition is then performed after a time delay. Figure 8 Six coronal images using flow-sensitive alternating inversion recovery with an extra radiofrequency pulse (FAIRER) technique with normal perfusion to both lungs. Perfusion-weighted images are obtained by subtracting the tagged image from the control. Image acquisition of both images is interleaved and performed within a breath-holding period. Cardiac triggering is used to ensure that all images are acquired at the same phase of the heart cycle, thereby reducing motion artifacts. The time delay between triggering and commencing image acquisition is 1600-2000 msec depending on the heart rate of the patient. A HASTE sequence, which has an intrinsically reduced susceptibility to heterogeneous magnetic environment, is used with an effective TE of 36 msec. The short echo spacing is 4.5 msec, which minimizes the effect of field inhomogeneities. A total of 72 differently phase-encoded spin echoes is acquired for a HASTE read-out, with the eight extra lines being used for phase correction in the half-Fourier image reconstruction. This example of a pulsed arterial spin labeling technique is a promising novel method to assess pulmonary parenchymal perfusion.